Jul 29 2016 - Brawn, brain and tears sum up the tone, temper and texture of the Republican and Democrat national conventions in Cleveland and Philadelphia respectively. The fiesta, patriotic fervour, quiet but eloquent sobbing ,depth of speaker line-up and story-telling presentations fleshed out with anecdotes were the mirror -image of American electoral democracy in action. 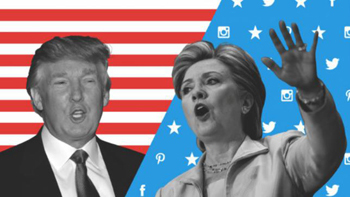 Beneath the dazzling tapestry, however, likability and trust issues dog the steps of Donald Trump and Hillary Clinton even as they have secured nomination for the US presidential election in November. An intensely polarizing campaign now sees a new twist, some say an escalation, to the email scandal centred around the use of a personal server by the former secretary of state. One would have thought we had seen the back of it after the FBI investigations. The probe while alluding to a serious lapse of responsibility had ruled out prosecution against her .The Democrat camp has lately accused Trump of inciting Russian ‘espionage’, a suggestion Moscow had earlier vigorously denied. Republicans are out to whip up a national security concern apparently in desperation over the steadying ship of Democrat candidacy. Women of the Movement for Care representing the victims of gun shots were present at the penultimate phase of the Democratic convention extending their support to Hillary. Her gun control policy found a resonance with them. Simultaneously, the results of Millennial Youth Research were revealed from the podium highlighting the vulnerabilities of Black youths vis-à-vis their White counterparts. Remember, the primaries were hard – fought, precisely , on two levels: First, between the principal candidates ;and secondly the challengers within the parties battling it out to basically to fathom their chances .Chiefly motivated to resist a frontrunner; this in part may have also been actuated by a desire to create a vote bank by way of influence-peddling. Some of the contestations in the primaries were taken to the national conventions. Ted Cruz who refused to endorse Trump in the convention had to be booed out by “Trump” ,Trump” yells . By comparison , the intensity of passion and level of sophistication exuded by Bernie Sanders in his adversarial posture towards Hillary Clinton were way above the crudity and humiliation traded between Trump camp and Ted Cruz. It is a huge add-on to the electoral culture that Bernie with his Left predilections and for all his support base among young men and women by virtue of his commitment to social and economic justice and equal opportunities has proved a statesman of no small measure. Although he let his differences with Clinton go down to the wires, he pulled back in time to retain his clout to negotiate a deal with her on projects close to his heart as well as extend the much-needed support to her at the nick of time. Powerful endorsement speeches intelligently crafted to cut corners were delivered by party big wigs , former high public office holders, iconic figures ,vice presidential nominees ,let alone spouses , sons and daughters of the candidates . It is a participatory inner party democracy opening out to a broad spectrum representative system, largely backed by money and served by merit that projects the strength of the US as we know it. It took 134 years since the American independence for women to be voters; nearly a century is passing us by from that watershed moment with a historic responsibility devolving on the US electorate to have their first woman president. After breaking the jinx of a non-white president, it is turn for a woman incumbent in the White House.